Anonymous sale, Sotheby's, London, 4 July 1974, lot 220. Anonymous sale, Maître Blâche, Versailles, 27 June 1984, lot 59. Anonymous sale, Sotheby's, London, 20 March 1985, lot 134. M.C. Sainsaulieu & J. de Mons, Eva Gonzalès, Etude critique et catalogue raisonné, Paris, 1990, no. 7 (illustrated p. 64). 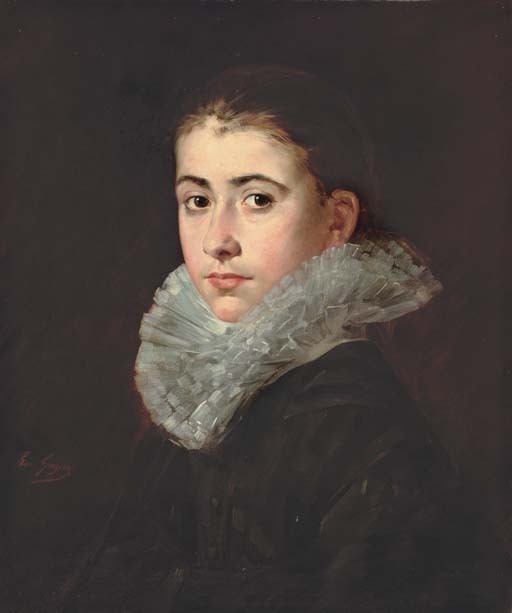 In this striking portrait of a young beautiful woman, Eva Gonzalès employs a restricted palette, with an undefined dark background contrasting with the lighter tones of the sitter's face framed by a high white ruffled collar, accentuated by strong front lighting. Such techniques recall the early 'Spanish' paintings of Edouard Manet, her teacher and mentor, and although possibly painted before Gonzalès entered the older artist's studio in February 1869, the present painting is certainly indicative of how keenly she admired his work. Unsatisfied with the ideals of academic art imposed by Chaplin, she engineered a meeting with Manet, with the help of her friend, Alfred Sisley, and was soon to have the honour of being Manet's only ever student. 'In February 1869 a dazzlingly beautiful, young girl appeared on rue Guyot. Her name was Mlle Eva Gonzalès...She admired Manet, greatly desired his words of advice...It was understood that she would be his student...the only student Manet had ever had' (A. Tabarant, Manet et ses oeuvres, Paris, 1947, quoted in M.C. Sainsaulieu & J. De Mons, Eva Gonzalès, Paris, 1990, p. 149). Portrait de jeune femme is an interesting transitional work. While evocative of Manet's later influence, its highly polished surface, soft tonal modeling and finely detailed rendering of the sitter is more closely associated with Chaplin's studio. This exquisite and sensitive portrait belies the comparative youth of an artist scarcely out of her teens, and heralds an extraordinarily accomplished career despite her tragically early death at the age of thirty-four.